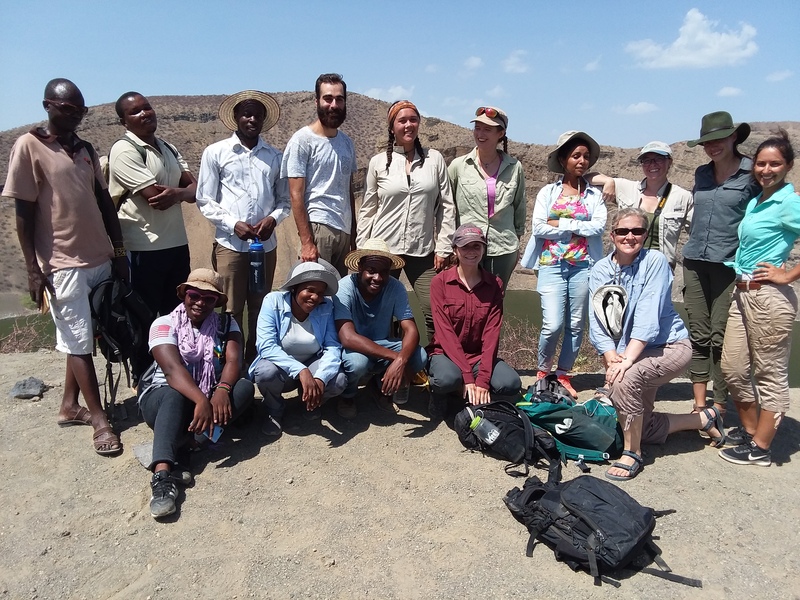 As a reward for their hard work in the field, the group spent last Sunday in the nearby town of Lodwar. Lodwar is the closest population center, and it is growing in size every day. The students enjoyed milkshakes at the Diner and some shopping for traditional trinkets like handmade baskets, kikois, and beaded jewelry. Students buy beaded jewelry at Lodwar (photo credit: Dorien de Vries). 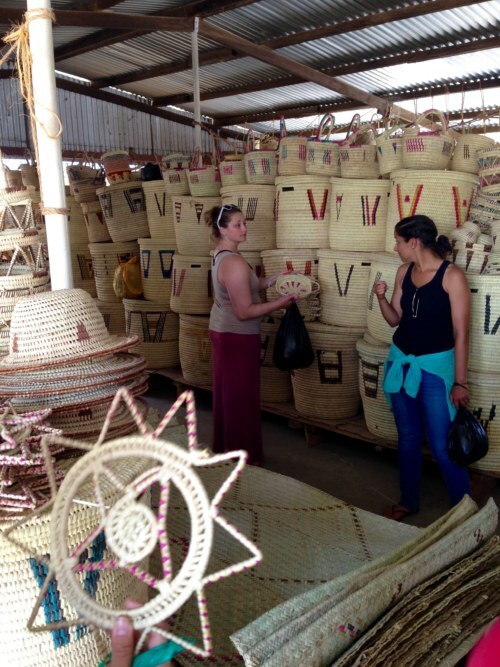 Kelly (left) and Petra do some basket shopping at the local basket market in Lodwar (photo credit: Dorien de Vries). On Monday, however, it was time to go back to work! 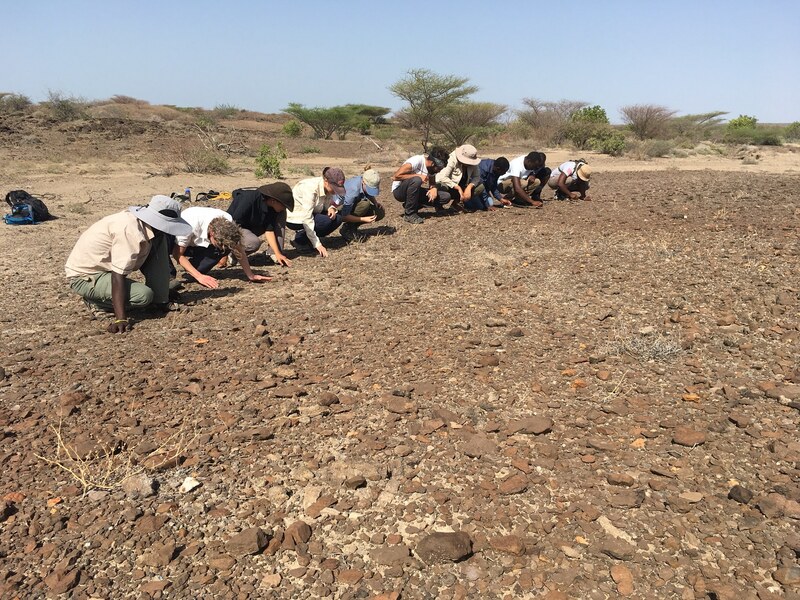 The students have been working closely with the senior members of the Later Prehistory of West Turkana team to process the artifacts and samples that were collected last week during fieldwork. Excavation is an important facet of archaeology, but perhaps even more important is the description, analysis, and eventual conservation of what is found. 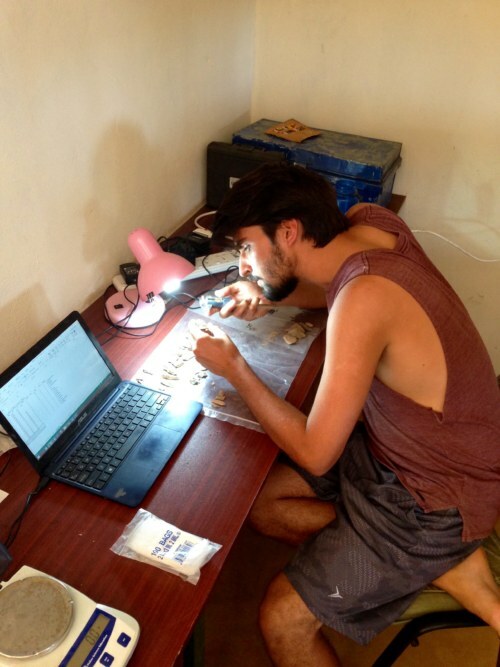 Many of the students have spent hours in the lab assisting Dr. Steven Goldstein with analysis of over a thousand lithics that were collected from Lothagam. 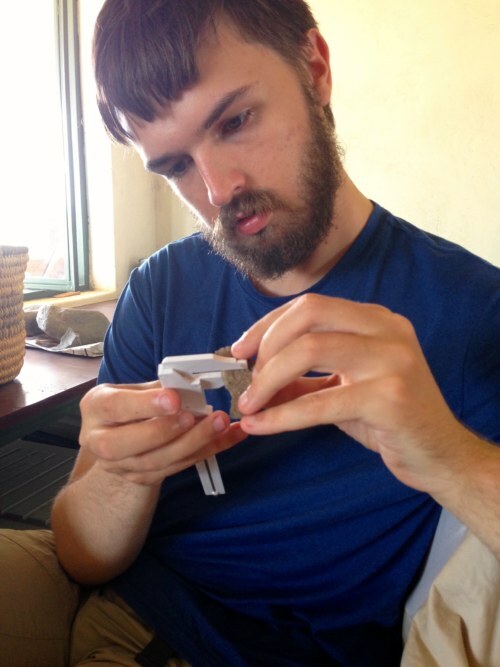 Evan and Morgan have worked on these samples primarily, under the supervision of Dr. Goldstein, to characterize the raw materials and take standardized measurements of these stone tools. These measurements will help reconstruct the tool production and tool use strategies of ancient peoples. The students also cataloged and curated other artifacts, such as animal bones and pottery. Ryan (left), Morgan (middle), and Evan (right) measure flakes (photo credit: Dorien de Vries). 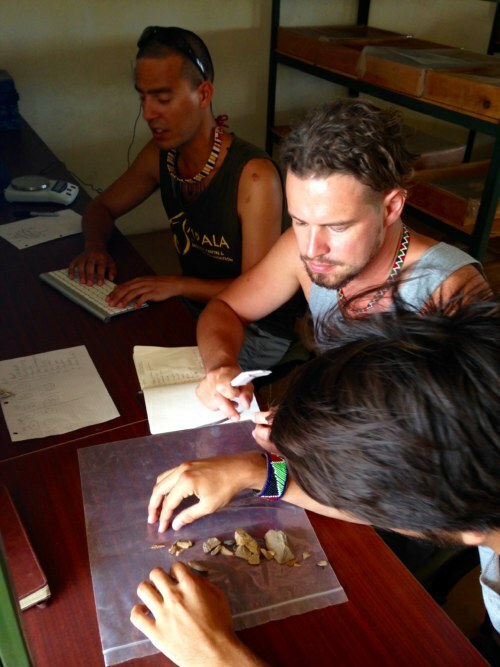 Evan studies flakes from Lothagam (photo credit: Dorien de Vries). Morgan measures a flake in the TBI Turkwel lab (photo credit: Dorien de Vries). 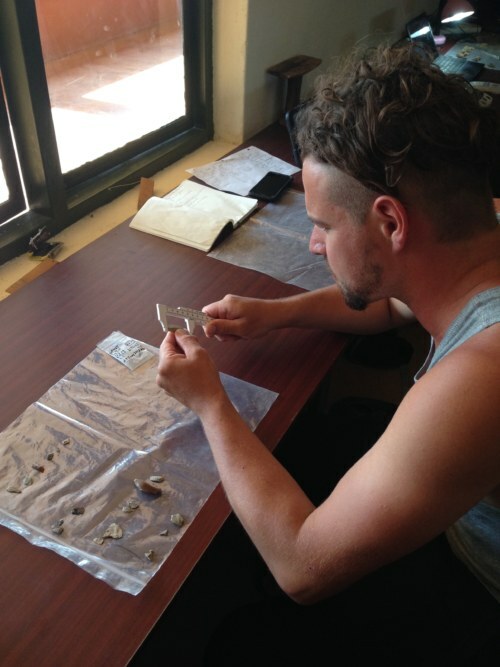 Nathan measures and describes pottery sherds (photo credit: Dorien de Vries). Other students have been working with Dr. Storozum to process the geoarchaeological data collected last week. 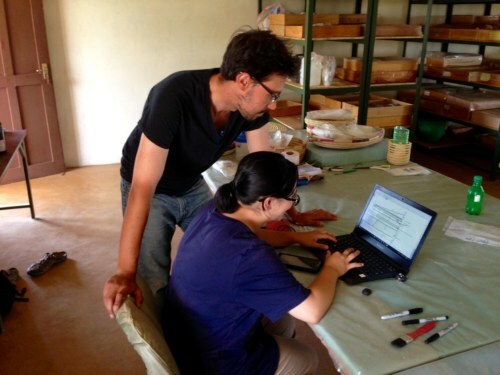 Adrianne and Nathan have worked very hard cataloging sediment samples and digitally reconstructing excavation profiles. Geoarchaeology is one of the most important aspects of fieldwork, since it allows archaeologists to reconstruct a site’s depositional history and environmental context. By examining the changes in the sediment size over time, we are able to reconstruct rapid and more subtle fluctuations in lake levels. Layers consisting of larger sand particles and pebbles represent periods of time that these areas likely were at the edge of the lake. Layers consisting of finer sediments, silty and very fine sands, represented periods of time when Lake Turkana was larger and these areas were part of the bottom of the lake. The artifacts that we recovered are all embedded within different types of sediments that represent a variety of lacustrine environments. Without understanding how the artifacts were laid down, and what sorts of environments existed nearby while the site was occupied, it is impossible to draw strong conclusions about the people who made and used them. By correlating the environmental data and the technological changes in human artefacts, these two lines of evidence allow archaeologists to interpret how people’s subsistence strategies changed during rapid climate change around Lake Turkana. Adrianne digitizes geological profile drawings with Dr. Michael Storozum’s help (photo credit: Dorien de Vries). 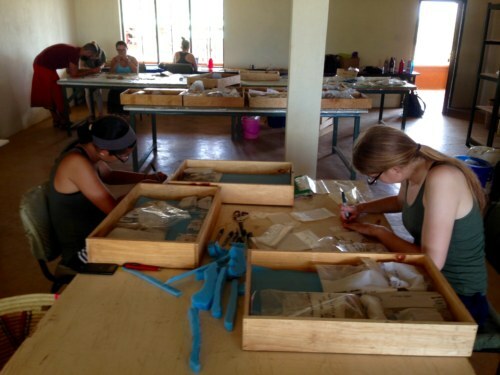 Students work on finds curation in the Later Prehistory lab at TBI Turkwel (photo credit: Dorien de Vries). This year, post-excavation curation and cataloging tasks included especially sensitive material: during fieldwork, the team found human remains eroding from the surface of the site. Likely dating to the site’s occupation ~9000-6000 years ago, the human remains were in danger of being lost to erosion: each year, rains steadily impact the surface of the site and deepen the gullies that cut into its sides. Bioarchaeologist Dr. Elizabeth Sawchuk directed salvage recovery of particularly vulnerable specimens, which otherwise would have been washed away. During fieldwork and back here at TBI this week, Dr. Sawchuk has taught students about the proper handling of human remains through all stages from detection to excavation to museum curation. This has included discussing ethical questions, such as how to consider and balance scientific research priorities with the presumed intentions of the original site inhabitants and the wishes of communities in the area today. Students have also learned about practical techniques, such as use of consolidants and various reconstruction methods, from Dr. Sawchuk and professional TBI conservators. 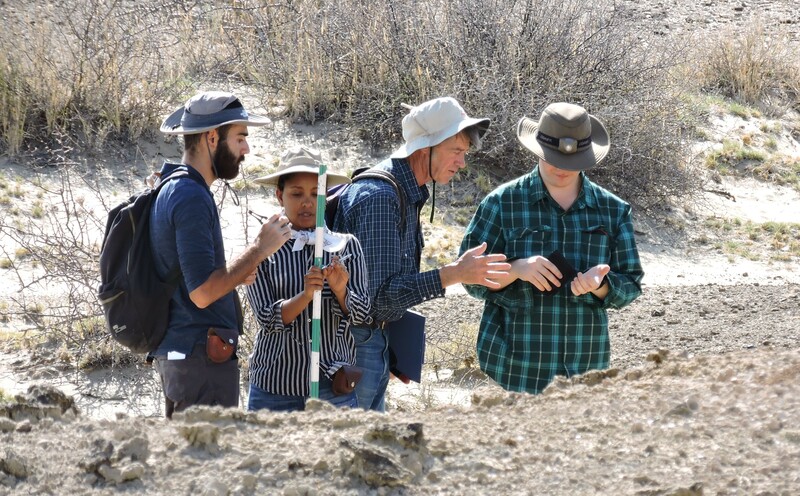 These activities have given students first-hand perspectives on the practical, intellectual, ethical, and emotional challenges of bioarchaeological research. 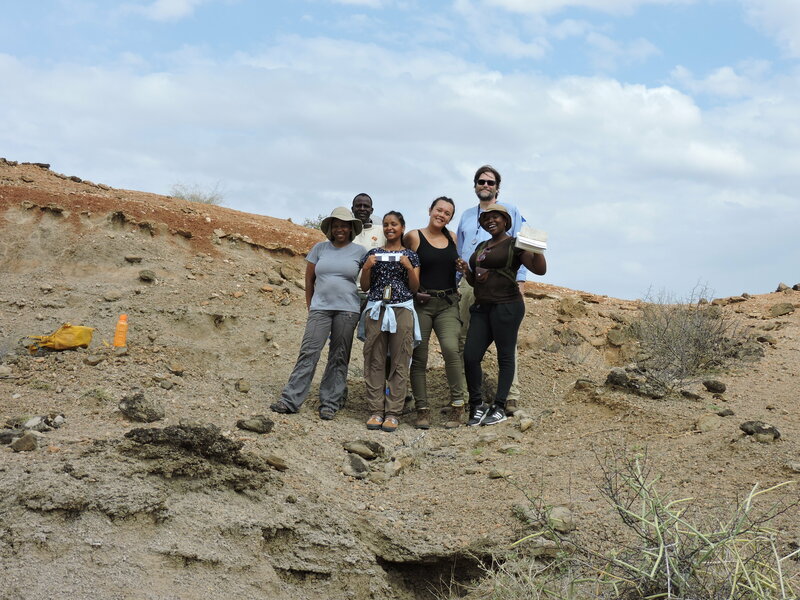 Sheng has been learning from the professional fossil and bone conservators at TBI Turkwel (photo credit: Dorien de Vries). 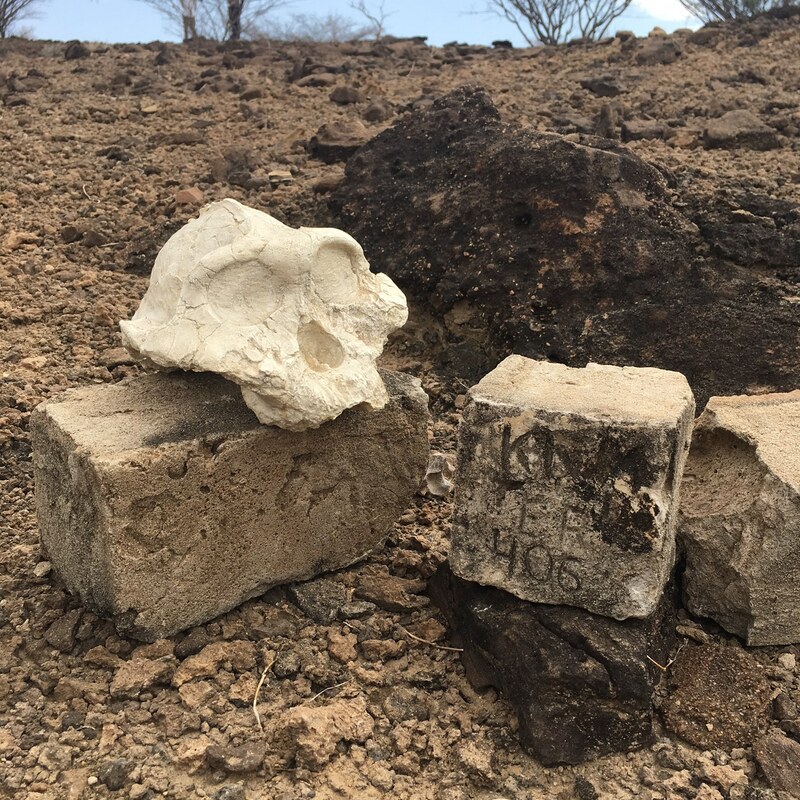 Another project one of our students has been working on is the multimedia aspect of the Later Prehistory of West Turkana project. Ian has been conducting interviews with the project members and shooting video footage that can be used for future grant applications to ensure archaeological work continues at these fascinating sites. Ian sets up his camera gear for an interview with Dr. Elizabeth Sawchuk (photo credit: Dorien de Vries).